An announcement about digital images of German baptismal certificates at the Newberry Library in Chicago flew across my screen and I immediately decided to search them. Looking at the catalog entry first is advised–the vast majority of these items are apparently from Pennsylvania–according to their catalog entry. Always know what you are searching–don’t assume the collection contains material that it does not. Just because this collection is housed in Chicago, Illinois, does not mean that it contains only Illinois materials–or any Illinois materials. For years I did not realize a relative who died in her early twenties had married. The only reference I had to her was in her grandfather’s estate settlement where she’s mentioned as having predeceased him. She did marry and was married at her grandfather’s death. 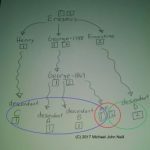 She had married a man whose last name was the same as her maiden name–so her last name never changed and the “name change” clue one would expect to have was not there. 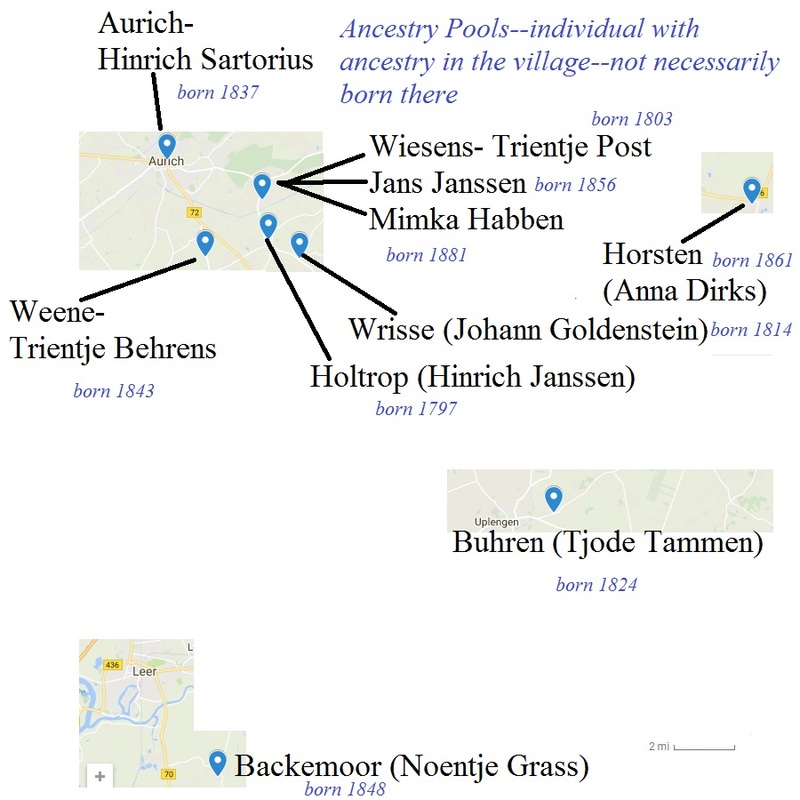 Custom create your own maps to help you visualize how close (or not) your ancestral villages are. This one was helpful for me in analyzing my DNA results. Each name is an ancestor with ancestry from the village listed before their name. Having all the places on the same map made visualization easier. 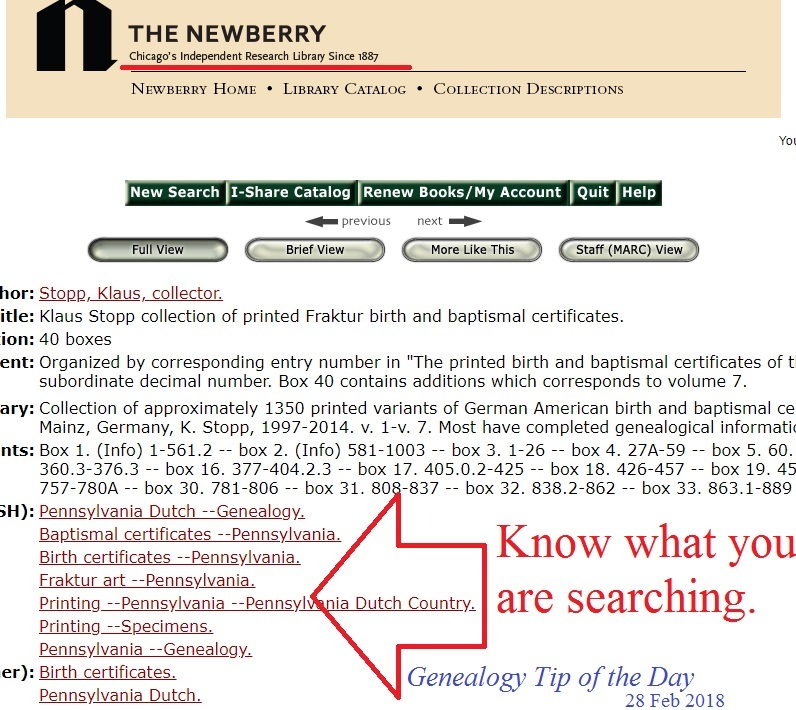 Genealogy Search Tip—websites I’ve discovered and the occasional online research tip–short and to the point? Subscription/Unsubscription links are on the top of each page. Unsubscription links are also in each email sent. Thanks to our sponsor, GenealogyBank. for their continued support. Avoid setting your search at any site to “match exactly.” Names get spelled incorrectly, places of birth are incorrect, ages are off, etc. There There are times where exact matches will get you what you want, but many times it can limit your search to the point where the desired item is not returned. This is especially true for any name that is in a foreign language or the informant does not speak the local language. Is it possible that the last name you think you have for a person is really a truncated version of the actual name? Could the last half of the name have been “cut off” to avoid sounding a little too ethnic? Could your VanDerWalle relative used the last name of Wall(e) instead? Don’t assume that online site will “always be there” and you can always go and get what you need. Make a copy of that image for yourself while you have it on your screen. Save the information while you have access to it. Websites go down. Fee-based websites sometimes lose the ability to include certain items in their subscription. Websites change how things are organized and what you could find a month ago is impossible to find. Your cousin could remove their online tree from that hosting site. You may find yourself unable to continue to pay for that monthly subscription to that database site that includes images. Save it while you can. Name it in a way that makes sense. Save it where you can find it. Make backup copies. Later you will be glad you did. “Late in life” marriages can be a good source of additional information on a relative, particularly during a time period when marriage records provide more information that just a name. However, in cultures where women take the last name of their husband, these marriages can cause a woman to disappear. 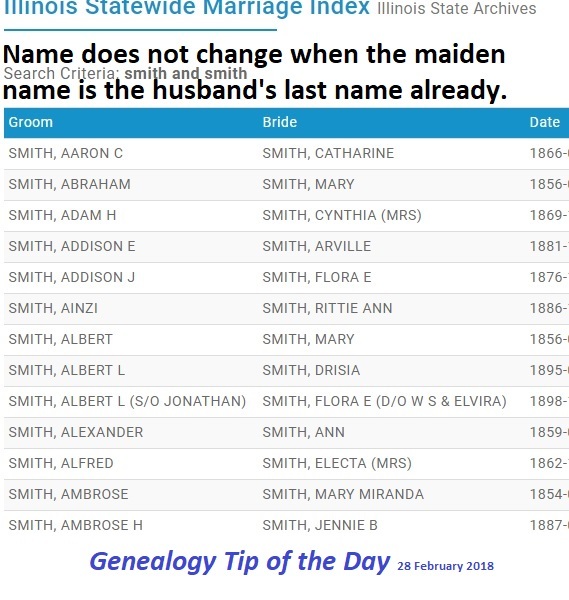 Always consider that the reason a female cannot be found is that she might have married again and changed her last name. Or she may have moved a distance to live with a child. A Civil War pension indicated the soldier was born in Duncansville, Kentucky. As I suspected it was not on a modern map. There are several ways to locate a place name that no longer exists–one way is to search for it on GoogleBooks where old books have been digitized are full-text searchable. 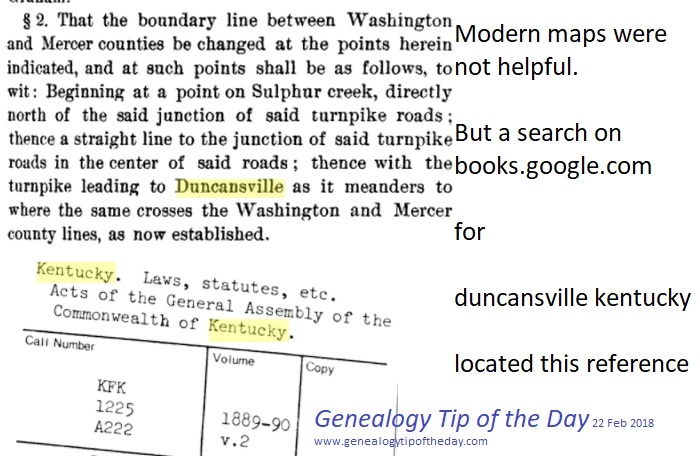 An 1889 reference to the change in the Mercer-Washington County Kentucky line mentioned Duncansville. That gave me a clue as to it’s location.